Can you imagine this listing? TURTLE LAKE, WISCONSIN: Charming summer home with three bedrooms, one bathroom, fishing/boating dock, screened porch, and pink and yellow striped aluminum siding. Convenient, close-to-town location. Must-see. When Thom Jordan went to the hardware store to purchase pink aluminum siding the (undoubtedly amused) clerk told him that he probably didn’t have enough pink siding in-stock to cover the whole house. No bother, he just picked up some of Carroll’s other favorite color, yellow. 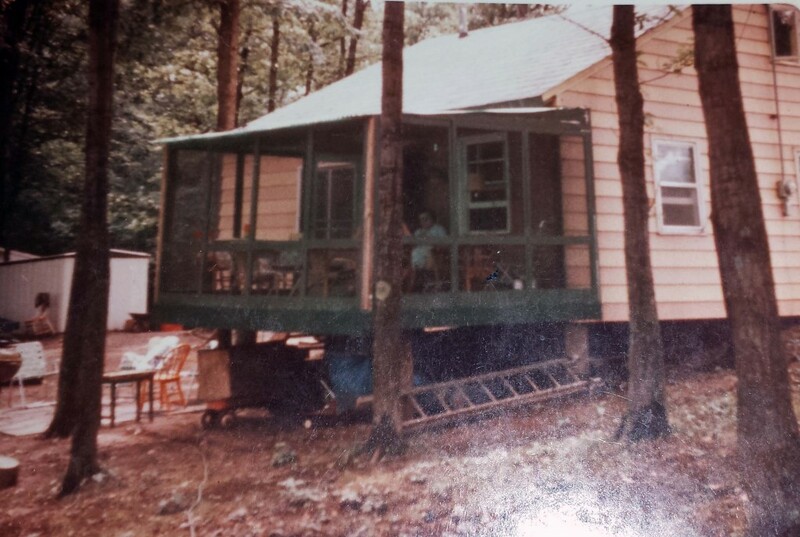 Much to their neighbors’ horror, the colorful cabin was completed and remained that way for nearly 25 years. Jordan fought in World War II. He parachuted out of a plane engulfed in flames; he met Ernest Hemingway during après ski in Sun Valley, ID; he met Harry Truman and discussed politics with him in a hotel lobby in Chicago, but of all of the extraordinary stories told at Jordan’s funeral, the one about the pink and yellow cabin was the one that blew me away. For whatever reason, my flight back to Chicago was delayed for hours, leaving lots of time to think about the day’s events. It was a beautiful, patriotic send-off for my best friend’s dad, the likes I had never seen before — taps on the bugle, deafeningly loud shots fired from rifles, 90-year old honor guards hoisting flags and an American flag-draped casket. But wouldn’t you know it, I kept thinking about that kooky two-toned cabin. Here was a man who loved his daughter so much that he chucked aside pride, logic and perhaps a little common sense to make her happy. It made me wonder how many other homes have stories like this, a history that anybody looking at its listing online wouldn’t possibly understand. Beyond all of the home-marketing tactics agents must practice, it occurred to me that story telling is perhaps the most valuable one. I just watched a great course in Leading Real Estate Companies of the World’s Institute created by Matthew Ferrara called Masterpiece Marketing, and it emphasized how important it was to sell a home’s back story. Don’t make it about the stainless steel appliances and granite countertops, as they elicit no emotional response. Make that personal connection; tell the history, share the home’s biography — that can speak volumes, more so than a new dishwasher. If your agents haven’t taken this course yet, it’s a good one. Colorful siding and all, the home sold; I just hope the Jordan's REALTOR® shared the history of the cabin with his or her buyer, explained how the home created a lifetime of memories for its owners and was indeed, Thom Jordan’s masterpiece. Beth Kinsella is Member Solutions Manager for Leading Real Estate Companies of the World®. To learn more about Leading Real Estate Companies of the World®, visit www.LeadingRE.com.